Even with our annual 2 day November Big Brand Event, we are still continuing with our weekly website offers. Remember, these are fantastic products to promote as the perfect presents for friends and family and I am sure you’ll be tempted to treat yourself too. Hurry – this is an exclusive online offer, so products are subject to stock availability and once they’ve gone, they’ve gone. Please note the link above will not change week on week, so please deeplink to this, the weekly offers pages are only live for that given week. This exclusive online offer is a designer dream world for every man that loves the thought of shopping for stylish clothes from prestigious brands. For one week only, we’re offering you the chance to buy clothes from top designer brands at incredible prices. We have a great range of luxurious brands, including Hugo Boss, Ted Baker and Ralph Lauren, so update your wardrobe with slick designer clothes and buy them at very special prices. If you’re jetting off for an adventure of a lifetime, chilling out with family and friends abroad or simply catching the winter sun rays, you won’t want to miss out on this fantastic offer. 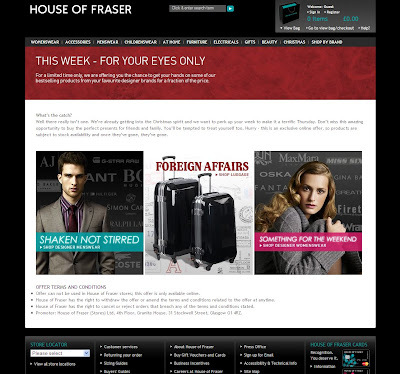 For one week only, we’re offering you the chance to buy stylish suitcases at fantastic prices. From compact cases for travelling light to the more spacious luggage for all those extra luxuries, travel in style with our top brands, which include Antler and Samsonite. For one week only, you can enjoy the latest fabulous designer brands for a fraction of the price. Stay warm this winter with trendy jackets and coats from Miss Sixty, MaxMara and Oska and enjoy your weekend partying in style, wearing a Gina Bacconi dress. It’s the perfect time to treat yourself to chic, elegant and sophisticated clothing that oozes designer flair and creativity.